Lady Wainwright presides over the gothic gloom at Belting, in mourning for her two sons lost in the Second World War. Long afterwards a stranger arrives at Belting, claiming to be the missing David Wainwright – who was not killed after all but held captive for years in a Russian prison camp. With Lady Wainwright’s health fading, her inheritance is at stake, and the family is torn apart by doubts over its mysterious long-lost son. Belting is shadowed by suspicion and intrigue – and then the first body is found. The story’s set up is not that unusual for a classic mystery: A man appears on Lady Wainwright’s doorstep, claiming he is her oldest son David who was declared dead in the second World War after his plane was shot down. Lady Wainwright, whose health is fading, needs not much convincing and happily accepts the man as her son. Miles and Stephen – her two other sons – are less certain that the man is really their oldest brother. Not long after he appears, a murder happens. The only slightly unusual thing about it so far is the narrator: Christopher. He’s a distant relative who was taken in by the Wainwright’s after his parents’ death in a plane crash. So, he’s neither a policeman nor one of those amateur sleuths who keep tripping over bodies. He’s a family member but removed enough to be more level-headed about the whole affair. 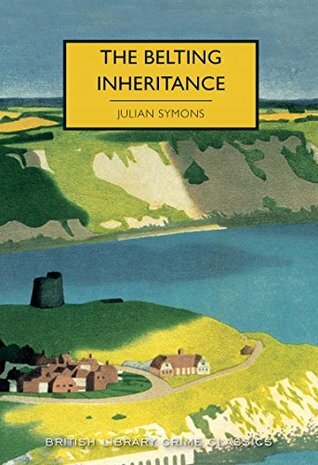 He has neither Lady Wainwright’s deep desire to see her favourite son alive nor the other sons’ worry about having to share their inheritance. That means he has neither reason to believe David nor to disbelieve him. And then there’s the final third of the book: In it, Christopher finds something that suggests a quite definite answer to the question “Is this man really David?” But he doesn’t show it to anybody in the family. He leaves a note saying “I know what’s going on! Now I’m off to Paris” And then he is off to Paris where a string of miraculous coincidences happen and he has a revelation that solves everything while he is drunk on pastis and watching an Ibsen play. It all reads like the author had a maximum page-count and had a hard time resolving the multitude of threads so he just went “Oh who cares? He knows this because…because you are more intelligent when you are drunk! GENIUS! GIVE ME AN AWARD!” That’s a shame because once I had made my peace with Christopher’s annoyingness, I enjoyed the story and all the twists and turns it took. And I think the solution is very clever – but the way we got there isn’t. Oy… hm… I don’t think I’ll try this book thanks!